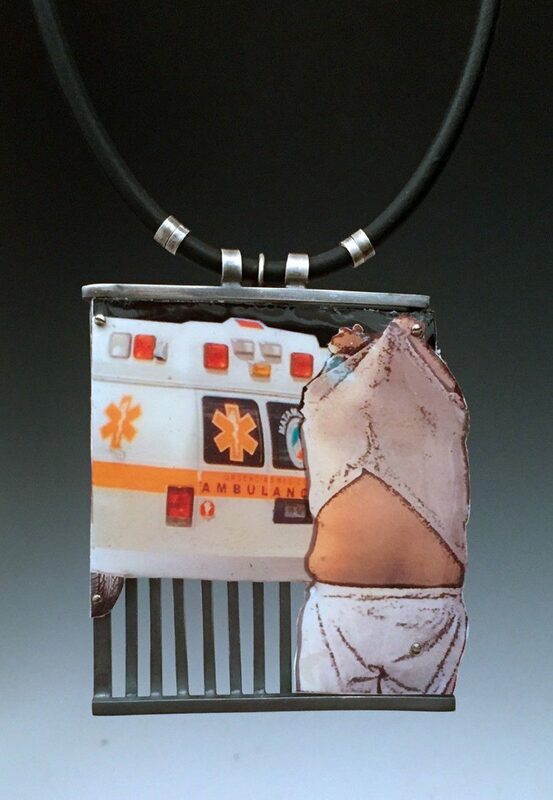 Jewelry, as an art form, is rarely expressed in single artist shows. That is why this solo show of wearable art displayed at the International Museum of Art and Science is a must-see for the region. Artist Nancy Moyer has many facets. Known locally for her critical art reviews, long-standing support of the art community, and as an administrator and retired art Professor Emeritus from the University of Texas-Pan American continues her career as an art jeweler. Moyer’s work is her commentary on the views of people who don’t understand the complex nature of our southern border. 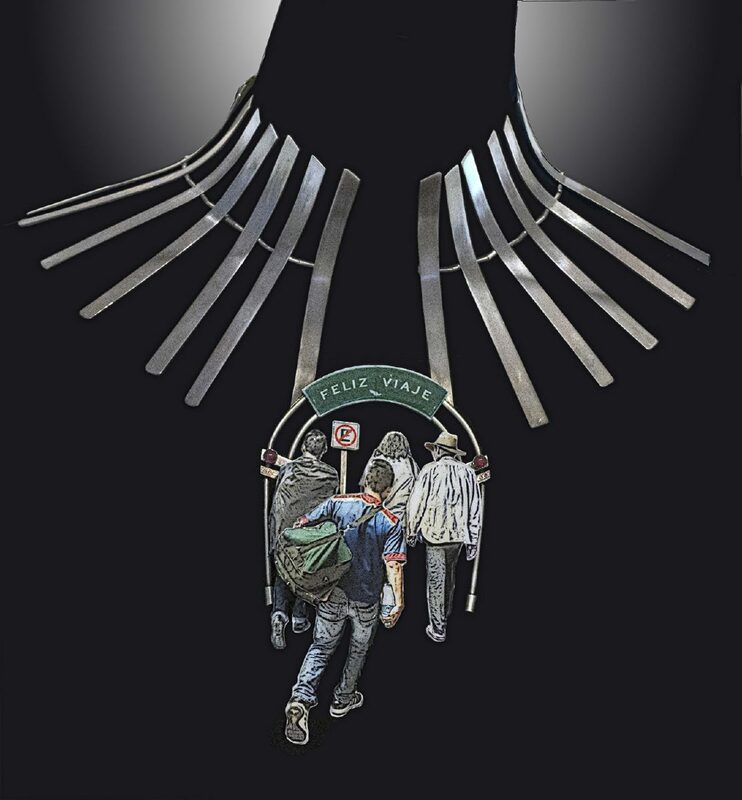 Her circus-like portrayal of the border through her wearable art intends to poke fun at inauthentic political perceptions, though she writes opaque artist statements that avoid charged politics. Her objects, however, are visually loud in both factual and fantastical expression. The intention of the work is to start a conversation. Moyer’s recent works include photographs that contrast the experience of U.S. citizens, immigrants and visitors lining up for entry into the United States. Images show tourists, visiting Mexico for inexpensive medications and dentistry, calmly lining up for reentry into the U.S. while persons of Latinx descent are being searched. Moyer has used photography in her work for decades. For the artist, the photographic image relates both to reality and to illusion. In contrast, the work also echoes representations of Mesoamerican peoples. These disputatious representations are translations of another regional artist and painter, Mark Clark. Clark references figures and images from the Codex Borgia, which visually describe Mesoamerican allegories. He appropriates Codex figures and modernizes them through his Gallery 409’s fenced view of the Brownsville-Matamoros border. In contrast, Moyer utilizes his figures as characters to describe what would be too complex and gruesome if portrayed realistically. This is in deliberate contrast to her photographs of orderly people stoically waiting at international crossings. The translated figures in Moyer’s work present a “theater of the border” and the view of the national stage mixed with raw truth. Her choices reveal violence related to the making of money — violence existing on both sides. These representations are the vehicle she uses to introduce humor into potentially grizzly reality. 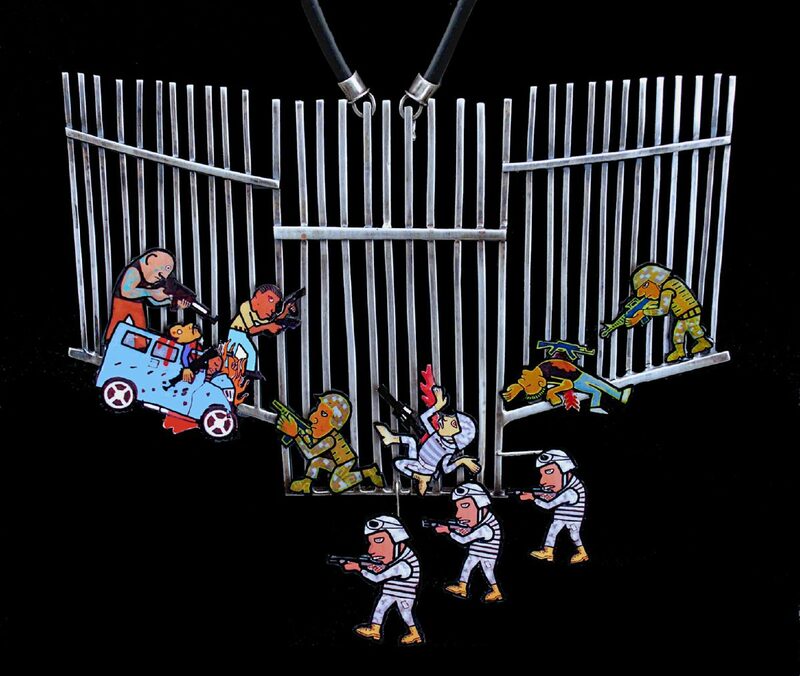 Figures in the work are depicted stereotypically referencing the problematic view of the border. Crosses, ladders and running slatted fences are all repetitive themes in Moyer’s work; they serve as symbols. Crosses are hope. Ladders are strife. Fences are the backdrop functioning as the stage, a prop and an actor, al mismo tiempo, or simultaneously. Unity and rhythm are achieved through the repetitive use of these symbols in Moyer’s work. Rhythmic tines of the fence reference regularity in the monitoring of the border. Imperfections in the fabrication of the fence are artistically used to show the problematic reality of the construct. The use of oxidation separates night from day in the vignettes. There is a theme of an unending flow of human beings that runs throughout the work. It is as if we are watching a person inaccurately clicking head counts at the entrance to an amusement park. 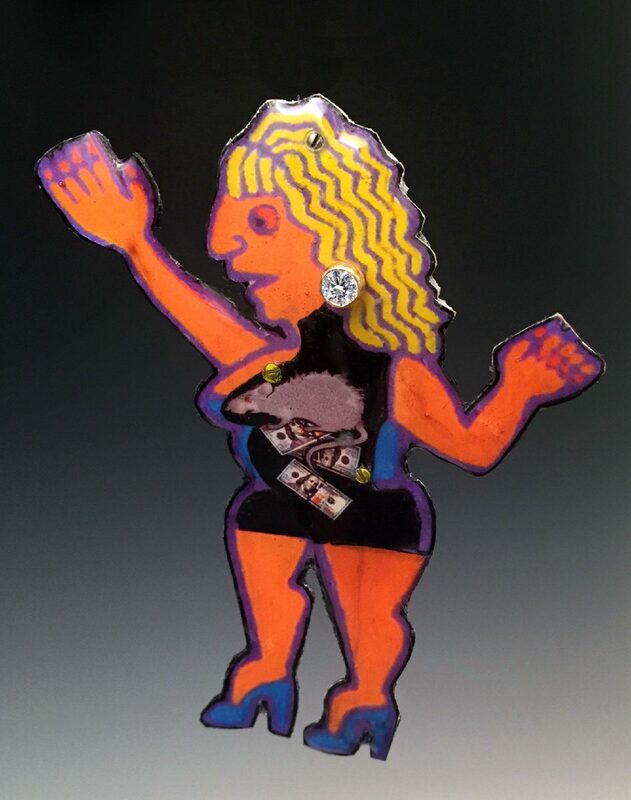 A related brooch in this exhibition has received accolades by being accepted into La Frontera: Encounters along the Border at the Museum of Arts and Design in New York. The questioning and quality in Moyer’s work deserves attention and critical examination. Donna Mason Sweigart is an associate professor of art and design at the University of Texas Rio Grande Valley School of Art. She’s also a Study Abroad faculty leader.